Winner of the 2015 Daphne du Maurier Award for Excellence in historical romantic mystery and suspense! Can a curse strike twice in a woman's life? In 1854, 17-year-old chambermaid Clara Crofton was dismissed from Gravesend Hall for having fallen in love with Richard Blackwood, the younger son of the house. Alone in the world, Clara found a tenuous position as a seamstress, but she always blamed the Gravesend curse for the disaster that had befallen her - and for Richard's death soon after in the Crimean War. Now, more than 18 years later, Richard's twin, Atticus, seeks out Clara with a strange proposal: If she will marry him and live with him as his wife in name only to ease the mind of his dying father, Atticus will then endow her with a comfortable income for the rest of her life. Clara knows that he is not disclosing his true motives, but when she runs out of options for an independent life, she has no choice but to become Atticus' wife. For Clara, returning to Gravesend as a bride brings some triumph...but also great unease. Not only must she pretend to be a well-born lady and devoted wife to a man whose face is a constant reminder of the love she lost, but ominous portents whisper that her masquerade brings grave danger. "This house will take from you what you most treasure," her mother once warned her. But the curse has already taken the man Clara loved. Will it now demand her life? Learn how Clara's thrilling story unfolds in With This Curse, an addictive Victorian romantic suspense novel by Amanda DeWees. Listeners who enjoyed DeWees' acclaimed gothic novel Sea of Secrets as well as those who love Victorian mystery and traditional gothic romance alike will be captivated by this strong yet vulnerable heroine and her suspenseful journey through the perils of heartbreak, danger, and love. A delicious gothic romance ! The writing is witty and eloquent, and the narration is perfection. Just don't look too closely at some of the gaping plot lapses, and let the romance and prose work their magic. 4 sur 4 personne(s) ont trouvé cet avis utile. I have been reading some rather dark stories lately so With This Curse was just the thing to counteract that. I read TONS of gothics as a young adult so it's a genre I have a lot of affection for. This one does not disappoint with an upright heroine, a cursed house and a hero who is a refreshing change from the mysterious dark stranger type so usual in gothic romances. I also liked the fact that the heroine was considerably older than the usual, with much more life experience. I had the story "twist" figured out long before our heroine though and that is my only quibble about the story. Elizabeth Klett's narration is excellent with an impeccable British accent. It was a very enjoyable story, well told by her. OMG! 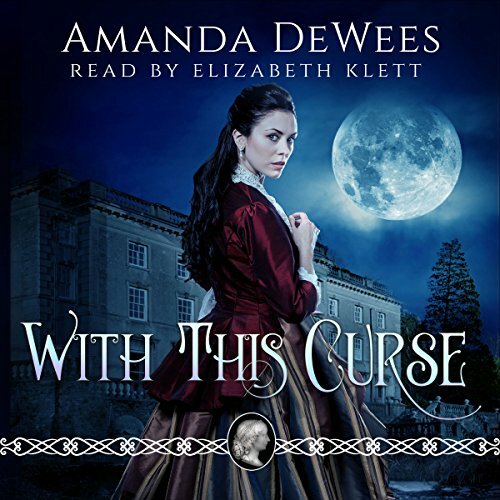 I just loved With This Curse by Amanda DeWees! I listened to the whole thing in 2 days (plus worked 20 hours at work without listening ). I'm running on no sleep! Written as a true Gothic historical romance, With This Curse is part murder mystery and part love story, with a few hints of the supernatural. The story centers on Clara who at 35 years old is asked by Atticus, the son of a former employer, to marry him. Clara is reluctant to accept because 18-years ago she was wrongly dismissed as a chambermaid after she fell in love with Atticus's brother Richard, who died soon after her dismissal. Fearing poverty when her current employer no longer needs her, Clara agrees to Atticus's proposal. What I enjoyed most about this story is the slow development of admiration and respect that Clara develops for her husband, which soon matures into love. The story flows very naturally and seamlessly. Elizabeth Klett’s narration is absolutely fantastic. She really brought the characters to life, giving each character their own distinct voice. She was very believable and helped me become totally engrossed into the story. Elizabeth Klett has quickly become one of my favorite narrators. Bravo! A truly hard to put down romantic story. I listened to it a second time immediately after I finish the first time. If you're interested in a unique romance with a different twist that has you wondering and guessing what will happen next, you should try this one. It’s one of those stories I will go back to frequently when I want an interesting feel-good book. Also, Elizabeth Klett is an amazing narrator that consistently does an excellent job. Her ability to bring characters to life with appropriate accents and emotions places her at the top of my list of favorite narrators. Loved it! This book has all the elements of a classic Victorian Gothic novel - a virginal maiden, a troubled hero, and a spooky house. I found the overall reveal was a bit transparent, but there are a few surprises and twists as the story unfolds. The fun is in the suspense and ambiance of the story. I will definitely be reading more of DeWees work in future. The narrator does a fantastic job. Klett brings the characters to life, giving each of them a distinct voice making it very easy to follow and enjoyable to listen to. Would you consider the audio edition of With This Curse to be better than the print version? I can't really say, because I only experienced the audio version. Would you recommend With This Curse to your friends? Why or why not? Yes. It's fun. A sweet romance, a little mystery, a house with a secret tunnel, and some Victorian clothing! The heroine is a nice change from the typical aristocratic ingenue: she's in her mid-30s, and she's been a servant/working woman all her life. The hero is also a breath of fresh air. He has a club foot, and he's NOT a rogue. What does Elizabeth Klett bring to the story that you wouldn’t experience if you just read the book? Her lovely English accent. Her reading is clear and precise. The ending. When my suspicions about where the story was going proved correct. The secondary romance is also nice. Well-written, keeps you listening expectantly. The narrator is outstanding; she has a melodious voice and does the English accents superbly. The story is a mystery of an old curse, but there are some great developments and turns in the plot to keep the interest and the curiosity up throughout. Much is not what it seems when our heroine Clara enters a marriage of convenience, without ever quite knowing the real reasons behind this arrangement. The 19th century setting comes off as very convincing and engaging, the class system, the characters and the portrayal of the times provide an excellent background for the romance. Exciting Read, with an Amazing Narrator!! This book is definitely a modern Gothic novel. What I mean by that is it had all the elements of a Gothic novel written in a modern style. It kept you interested in the story to the very end in an enthralling way but it was a bit shallow. Maybe because I just reread Wuthering Heights and Jane Eyre I was less impressed with this prose it was more a melodrama style with a very much less impressive twist than it's classic inspirations. I don't regret reading it at all and enjoyed it at the time but it won't make it on my rereads list. Elizabeth Klett was an excellent narrator though, she was the best part of this book. One of my favorite narrators of all time! I love the way she gives life to the characters making me appreciate the author's intentions more clearly. I would listen to her time and time again.